Ready to eat, shelf stable, high quality, delicious – We cannot help but love these gourmet food products. Below is a list of additional foods that require little to no preparOats Oatmealation on your end. What is so modern about Modern Oats? 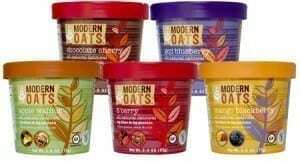 They start by selecting only the most nutrient & protein rich, non-genetically modified, pesticide free, gluten free certified, whole rolled, #2 oats. These are the highest grade from smaller, family run operations throughout the upper Midwest of North America. After selecting the oats they then blend with the finest, juiciest, antioxidant rich super fruits, omega 3 rich nuts, and seeds. Lightly sweetened with only evaporated cane juice, creating the most delicious, healthy, modern blends of oatmeal found today. Deep River Snacks is more than just a bag of chips. They pride themselves in doing right in everything they do. Deep River Snacks make snacking worthwhile by making snacks that are all natural with tons of flavor. They feel you shouldn’t have to sacrifice great flavor when you are buying a healthy snack. That is why Deep River Snacks’ potato chips are only made from all natural ingredients and are gluten-free, excluding any dyes, preservatives, and trans-fats. An American-made potato ship that also gives profits to charities. Cases can be mixed and matched with equal splits. 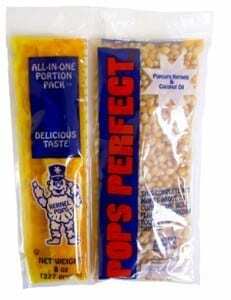 Portioned popcorn kernels with butter to quickly toss in any maker.